Here at Cloud 9 Farm we want you to sit back, relax and enjoy a true paddock to plate experience in our beautiful countryside. When you visit us at our cellar door we want to give you a taste of the Macedon Ranges. Your host Jacquie wants you to feel at home as soon as you walk through the doors. She’ll welcome you and tell you a bit about the farm and guide you through your own personal wine tasting. She can also take you on a tour of the winery if you like - you might even be able to catch a glimpse of our winemaker Alan, and learn all about the processes involved with our wines. You can then sit and be surrounded by the stunning panoramic view from our seated area, inside or outside while enjoying some wine and/or a cheese platter which includes preserves made from locally sourced ingredients. We love what we do here at Cloud 9 Farm and love sharing it with all who come into our home, so we hope you can forget the hustle and bustle of the outside world while enjoying sitting down to catch up with family and friends amongst our gorgeous valley views. With our property comes passion, with passion comes love, and with love comes hard work - with all this combined comes the result of what you will enjoy here at Cloud 9 Farm. 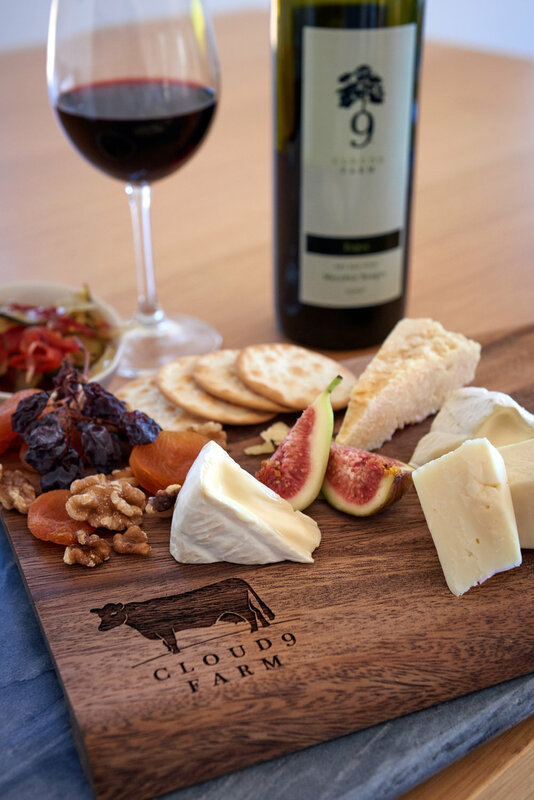 Cloud 9 Farm is situated beneath the picturesque Cobaw State Forrest in the Macedon Ranges. The original house vineyard block was established in 2002 with 500 grapevine cuttings that matched the soil and climate to get the optimum balance of yield and flavour without harsh chemical sprays.